Alison Worsfold from Hilton Nursing Partners receiving the Innovation Award from Robert Stewart from the Kent Pioneers Design and Learning Centre. Chris Woodward from Sai Care Homes receiving the Dementia Care Award from category sponsor Morten Mathisen from Sekoia. Friday the 14th saw the very best in the Kent care sector come together to celebrate the Kent Care Awards at the Great Danes Hotel, Maidstone. 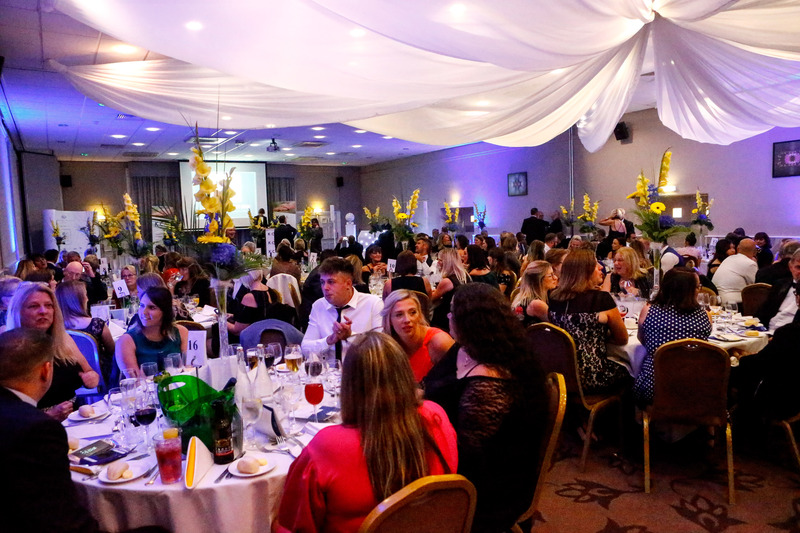 Now in its third year, the awards welcomed 300 guests to the gala evening to recognise caring excellence from front line workers in the care sector who work hard to improve the standard of care in the region. This year 188 nominations were received from companies across Kent with entries judged on dedication, commitment, innovation, career development, overall reputation, and examples of caring excellence. Danny Hutchington from Tudor Lodge care home, part of Sai Care Homes, receiving the Putting People First Award from category sponsor Katie King, from Hilton Nursing Partners. Bethanie Shepherd from Alexander House, part of the Nicholas James Care, receiving the Ancillary Worker Award from category sponsor Mick Farquhar from Citation. Holly Dalton from Hilton Nursing Partners receiving the Excellence in Nurse Care Award from Patrick Quinn from the Great British Care Awards. Melanie Norris from No Place Like Home, receiving the Home Care Worker Award by category sponsor Darren Humby from Quick to Care. Ancillary Worker Award – Bethanie Shepherd from Alexander House, part of the Nicholas James Care. Rhona McClelland from No Place Like Home receiving the Home Care Manager Award by category sponsor Laura Guntip from Lester Aldridge LLP. Pictured is Adam Hutchison, owner of the New Romney based Belmont Healthcare Group, winner of the Outstanding Contribution to Social Care. Sponsored by Kent County Council the event was attended by Cabinet member for Adult Social Care and Public Health, Graham Gibbens, and the newly appointed corporate director for adult social care and health, Penny Southern. The Annual Care Awards celebrate the work carried out by carers and care companies in Kent. The awards provide a chance to reward those people who have simply delivered something awesome whilst recognising the Kent care sector as a whole showing appreciation and recognising the good work everyone does day in day out, year after year. Next Article Care Homes are all over the place. Literally.